Trevi is a small picturesque town perched high on a hillside surrounded by olives trees as far as one can see. Most of the town is densely built in a spiral fashion around the hilltop with many buildings predating the 18th century. From town one can see one of the best views in Umbria, over 50 km to the west and on clear days as far away as Perugia to the north and even Monte Amiata in southern Tuscany. Trevi is well known across Italy for the high quality of its olive oil and holds a wonderful festival every fall in celebration of the olive oil harvest. How To Reach Trevi- Arriving in Trevi is been done by car although there are daily buses arriving from Foligno several times a day. Arrival by train is possible from Spello, Assisi, and Perugia, but the train station is several kilometers from the center of town and you must take a bus from the train station to Trevi. If you are driving, there is a large parking lot around Piazza Garibaldi just east of the walls. What To See – Trevi was a theater town back in Roman times and the Teatro Clitunno remains one of the town’s most important gathering places. Remnants of the rings of Mura Romana (Roman Wall) and Mura Medieval (Medieval Wall) still can be found encircling the town. The Museo della Civilta dell’Ulivo, or Olive Oil Museum is well worth a visit if you are in the area and can be found in an ex-convent on Lago Don Bosco #14. Although there are a couple of other museums housed in the same building, the olive oil museum is the highlight. The town’s main square Piazza Mazzini is home to the Palazzo Comunale, which was built in the 14th century. Later in the 15th century the large portico was added. From this piazza you can take Via San Francrsco and pass the Palazzo Valenti before coming to the very large Church of San Fransesco. This church along with the adjacent Raccolta d”Arte di San Fransesco is the town’s most important artistic attraction and the church is in fact not used for worship anymore. The museum houses a few Roman artifacts, but mostly a good number of Umbrian paintings from the late Middle Ages to the 17th century. The most important painting was once part of an altar, and it is by Lo Spagna. There is also a very interesting group of “ex‑votos” (paintings to thank God for saving a person from a sickness or an accident) painted by ordinary people, not famous artists, of the 16th ‑ century to the 18th‑century on display. Also in the center of town on Via della Rocca one comes upon Cattedrale di Sant’Emiliano, or Trevi’s Duomo, dedicated to a local saint. The duomo was built in the 12th century and renovated and enlarged in the 15th century. Saint Emiliano who served as the bishop of Trevi in the 4th century is honored every January 27th with a procession of the illuminata. One kilometer south of Trevi stands the Chiesa della Modonna delle Lacrime where in 1485 it is claimed that the painting of the virgin in a shrine cried tears of blood. 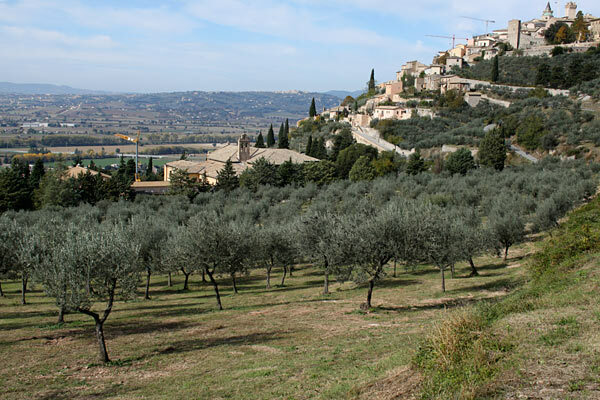 To get to the church leave town by Porta del Cieco and head downhill through the olive groves. From Piazza Garibaldi, outside the gate to the centro storico, take Via Ciuffelli to the 14th century Capuchin monastery and Church of San Martino. Over the door hangs a lunette by Tiberio d’Assisi who also has the painting St Martin and The Beggar inside. Eight kilometers south of Trevi you can see the Fonti di Clitunno, which is a well-known spot where several springs flow out from the rocks into large clear pools that attract ducks in a park-like setting with lush landscaping. About 500 meters north of the springs one can still find Tempietto del Clitunno on the SS3. It was belieed to be a pagan temple that was later converted to Christian use and thought to have originated in the 7th or 8th century.